In yesterday's post, "Is Conservatism A Cult?," we asked, "Have the Conservatives with their unlimited resources and unrestrained wealth beaten us? Have propaganda, lies, and the relentless pursuit of aristocratic privilege won the Class War?" "Over the past several decades, the American Right has invested heavily in media outlets and think tanks with the goal of imposing right-wing historical narratives on the nation. 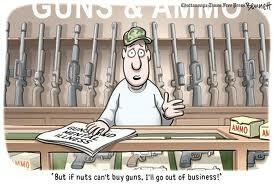 That investment has now paved the way for defeat of modest gun-control legislation in the U.S. Senate. "Because of this well-financed right-wing propaganda, millions of Americans have been convinced that the Framers of the U.S. Constitution wanted individual Americans armed to the teeth so they could kill policemen, soldiers and other government representatives. 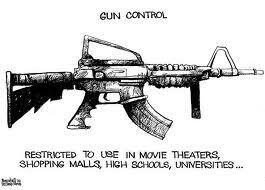 Thus any restriction on gun ownership, no matter how sensible, is deemed as going against the nation’s Founding Fathers. "The fact that the key Framers, such as James Madison and George Washington, actually believed that the people would be protected against tyranny through a representative Republic operating within the rule of law and the checks and balances of a Constitution has been lost amid the Right’s propaganda and paranoia. "Madison only grudgingly agreed to incorporate a Bill of Rights at all as a deal to secure the necessary votes for the Constitution’s ratification, with the Second Amendment essentially a concession to the states which wanted to protect their right to maintain citizen militias. "At the time, the right to bear arms within the context of 'a well-regulated Militia' was not understood as a 'libertarian' right to have an unregulated arsenal in your basement or the right to stride into public gatherings with a semi-automatic assault rifle with a 100-bullet magazine over your shoulder. In 1789, when Congress approved the Second Amendment, muskets were single-shot devices requiring time-consuming reloading. 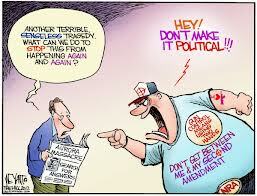 "But the Right has successfully abridged the Second Amendment as it is now understood by many ill-informed Americans. The 12-word preamble – explaining the point of the amendment – gets lopped off and only the last 14 words are left as the unofficially revised amendment. 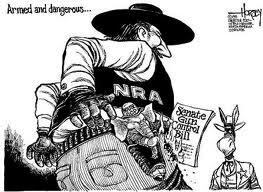 "So, when the likes of Tea Party favorite Sen. Ted Cruz lectures fellow senators on the Second Amendment, he doesn’t include the preamble, 'A well-regulated Militia being necessary to the security of a free State.' He only reads the rest: 'the right of the people to keep and bear Arms shall not be infringed.' Nor do the Tea Partiers note that to Madison and the Framers the term 'bear Arms' meant to participate in a militia, not to have as many guns as you want. "Now, even intelligent politicians like President Barack Obama genuflect before the mythology of the Second Amendment as he did on Wednesday when he stood with parents of children massacred in Newtown, Connecticut, and repeatedly argued that a defeated compromise on background checks for gun buyers in no way impinged on anyone’s Second Amendment rights. "No one, it seems, wants to get into the reeds on this issue and take on the Right’s false narrative, apparently hoping that those distortions can be simply overridden by public outrage against the thousands upon thousands of Americans who are killed by gun violence every year. But the failure to contest false narratives, especially ones as powerful as the nation’s founding myth, effectively dooms rational policy discussions. "Most perniciously, the Right – through its propaganda – has equated the federal government with the British Crown, treating any national effort to deal with domestic problems as the same as British troops marching on Lexington and Concord. That’s the message in the Tea Party’s hijacking of Revolutionary War imagery. "Yet, that would mean that Revolutionary War heroes like George Washington and Alexander Hamilton – as well as the Constitution’s chief architect James Madison – are stand-ins for King George III, since they were the ones who organized the Constitutional Convention in 1787. "Anti-Federalists rose to oppose the Constitution, in part, by claiming that federal authorities might destroy the system of state militias and then crush the individual states. Madison ridiculed that argument in Federalist Paper 46, which ironically is one that the gun-rights advocates often cite in arguing in favor of a fully armed population. "But Madison’s key point in Federalist Paper 46 was that when critics cite the Constitution’s potential for a tyrannical central government, they miss the point that it would consist of representatives from the states and the people. "In Federalist Paper 46, Madison then went on to offer a series of reasons why the Anti-Federalists’ fear of the strengthened federal government was absurd, especially since Congress would consist of representatives from the states and those representatives would assert the interests of their states. “'But what would be the contest in the case we are supposing [between the federal government and the states]? Who would be the parties? A few representatives of the people, would be opposed to the people themselves; or rather one set of [federal] representatives would be contending against thirteen sets of representatives [of the states], with the whole body of their common constituents on the side of the latter. "In other words, Madison judged this alleged danger of the federal government tyrannizing the states as nuts. "It is true that he continues in Federalist Paper 46 to play out what to him was the absurd notion of federal tyranny, noting that this imaginary federal army of oppression also would have to contend with state militias consisting of armed citizenry – which is the point frequently cited by gun-rights advocates – but the context of those quotes is that Madison had already dismissed the possibility of such an event as crazy. "Granted, one could argue that Madison failed to fully see into the future as he argued for the ratification of the Constitution, which he had worked so hard to create. For instance, as slavery became a contentious issue in the mid-1800s, Southern states rebelled in defense of the rights of whites to own blacks and then violently resisted President Abraham Lincoln’s efforts to bring the Confederate states back into the Union. "To this day, some white Southerners call the Civil War the War of Northern Aggression. In the 1950s and 1960s, the pattern played out again, albeit much less violently, when many white Southerners resisted the federal government’s outlawing of racial segregation. To some white Southerners that was another example of federal 'tyranny. "However, it is a gross distortion of history to cite Madison as someone who favored a “libertarian” right for citizens to operate on their own in the killing of police, soldiers and other representatives of the Republic. Rather, his proposal of the Second Amendment was a concession to what he regarded as paranoia among states’-rights advocates within the Anti-Federalist circles. "Indeed, one could argue that the Second Amendment has never been used to protect individual liberty, unless you’re talking about the 'liberty' of white Southerners to own African-Americans as slaves. "Beyond the language in the amendment’s preamble about 'a well-regulated Militia' and state 'security,' that is exactly how the Second Amendment was used. 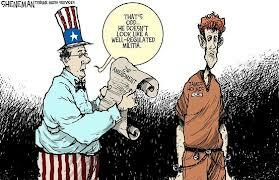 After being approved by the first Congress and ratified by the states, the amendment was given real meaning when the second Congress passed the Militia Acts, which mandated that all military-age white males obtain a musket and supplies for militia service. "President Washington then federalized several state militias and led them on an expedition into western Pennsylvania in 1794 to crush an anti-tax revolt known as the Whiskey Rebellion. The uprising was treated as an act of treason as defined by the U.S. Constitution, although Washington used his pardon power to spare rebel leaders from execution by hanging. "Over the ensuing years in the South, state militias were called up to put down slave revolts, with the rebellious slaves not as lucky as the white Whiskey rebels. For instance, in 1800, Virginia Gov. James Monroe called out the militia to stop an incipient slave uprising known as Gabriel’s Rebellion. Twenty-six alleged conspirators were hanged. 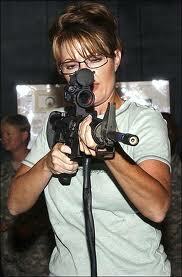 "Southern militias also were instrumental in the secession by the Confederate states after Lincoln’s election in 1860. Again, the central concern of the Confederacy was the maintenance and protection of slavery. "Yes, I know some on the Right have cherry-picked incendiary comments by other Founders, such as Thomas Jefferson and his remark that “The tree of liberty must be refreshed from time to time with the blood of patriots and tyrants” (although the context was Jefferson’s boasting that the new United States had seen little violence since its founding, with the exception of Shays Rebellion in Massachusetts in 1786-87). Jefferson also had very little involvement in writing the Constitution and the Bill of Rights since he was serving as the U.S. representative in Paris. "Only in modern times, with the emergence of an American Right angry over the idea of racial equality, has the Second Amendment been reframed as a 'libertarian' right to kill representatives of the elected government. That attitude flared up after Bill Clinton’s victory in 1992 and the rise of the 'militia movement,' which found a voice in the angry white radio talk show hosts who popularized the supposed linkage between the Framers and modern-day insurrectionists. 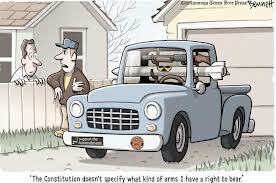 "After President George W. Bush claimed the White House and added two more right-wing justices to the U.S. Supreme Court, a slim five-to-four majority formed giving the Right’s reinterpretation of the Second Amendment some official sanction in 2008. The five justices overturned longstanding precedents recognizing only a collective right to bear arms and endorsed a limited individual right to own a gun. "Then, with the election of the first African-American president and the demographic change that Obama’s victory represented, the frenzy surrounding the Right’s false founding narrative heated up, with anti-government extremists naming themselves after the Boston Tea Party, an anti-British protest in 1773, and waving 'Don’t Tread on Me' Revolutionary War banners. "This symbolism merging the American Republic with the British Empire was profoundly wrong – especially since many Revolutionary War leaders including General Washington and his aide-de-camp Alexander Hamilton – were central to expanding federal powers in the Constitution. But the Right’s use of the Founding symbols was powerful nonetheless. "Essentially, however, the Tea Party operatives were not harkening back to the Constitution as much as they were to the Articles of Confederation, which the Constitution replaced, and to the Southern Confederacy, which sought to withdraw from the Constitution in the early 1860s. Today’s Tea Partiers are advocating a restoration of a system of states’ 'sovereignty' that Washington, Madison and Hamilton overturned in 1787 and which Lincoln defeated in 1865. "But the modern Right has figured out a new way to circumvent the real Constitution, which granted broad powers to the central government and which – as amended – guaranteed equal rights for all citizens. The Right has simply invested billions of dollars in a propaganda system that has revised American history. "The absence of any determined – or well-funded – effort to counter the Right’s false narratives has allowed this fabricated history to become real for millions of Americans. 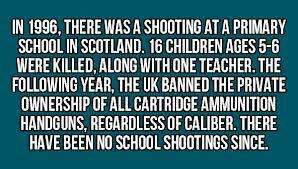 And, on Wednesday, it meant that even modest attempts to impose some sanity on the national gun madness, including the slaughter of children, was stopped in the U.S. Senate. 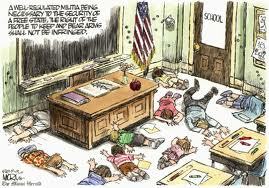 Are the Conservative leaders and their propagandists and Sheeplets preparing for an armed revolution? 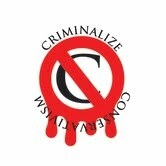 Should the Left arm themselves (http://www.criminalizeconservatism.com/2013/04/should-left-arm-itself.html)? (Investigative reporter Robert Parry broke many of the Iran-Contra stories for The Associated Press and Newsweek in the 1980s. You can buy his new book, America’s Stolen Narrative, either in print here or as an e-book (from Amazon and barnesandnoble.com).